Throughout centuries of warfare, soldiers could lie wounded on the field until the battle ended before receiving necessary care. That was bad enough in the era of swords and arrows, but the introduction of gunpowder during the fourteenth century caused the death rate to skyrocket. Still, it took another 400 years and a clever French army surgeon to devise a better system. Dominique-Jean Larrey created relatively lightweight two- and four-wheel horse-drawn wagons to transport the injured in the heat of battle. Larrey called his invention, which he conceived 215 years ago, in 1792, the flying ambulance. (He adopted the name from ambulancia, a term for “field hospital” credited to Spain’s Queen Isabella and derived from the Latin ambulare, “to walk.”) Larrey’s superiors—including Napoléon Bonaparte, who became commander in chief of the French army in 1795—took notice and charged Larrey with spreading the use of the ambulance throughout the army. As Napoléon’s campaign broadened, Larrey modified his flying ambulance to operate on various types of terrain. Ambulances were drawn by camels in the Egyptian desert and by mules in the mountainous regions of Spain, Poland and Russia. The ambulances’ success as well as Larrey’s skill as a surgeon—he could amputate an arm in 17 seconds—earned him a promotion to surgeon general. 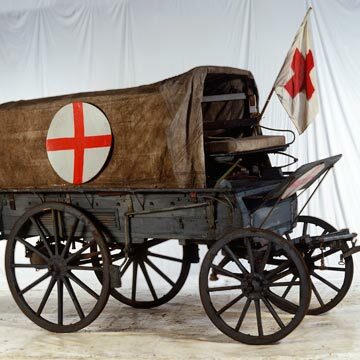 Although Larrey’s invention caught on with other armies, it wasn’t until 1869 that the first hospital-based ambulance service began, at New York City’s Bellevue Hospital. The horse-drawn carriages responded to more than 1,400 calls the first year. Thirty years later, Chicago’s Michael Reese Hospital introduced a motorized ambulance that could transport patients as quickly as a good horse: about 16 miles per hour. Larrey, whose wagons were equipped with horsehair-stuffed mattresses, could scarcely have imagined how his invention would evolve. Ambulances today can be outfitted with mobile electrocardiographs that transmit readings over cell phones; defibrillators that provide feedback on the speed and strength of a paramedic’s CPR compressions; and pupil-monitoring devices that register the neurological status of an unconscious patient. EMTs can use Web-based data to overlay variables, including weather patterns, traffic jams and hospital bed counts, to decide how and where to take patients, says Robert Bass, an emergency physician and executive director of the Maryland Institute for Emergency Medical Services Systems in Baltimore.